Titanfall is an Xbox- and PC-exclusive, but future sequels could come to other platforms. Titanfall is not coming to PlayStation or Nintendo platforms - ever. Potential sequels in the series could be on platforms beyond Xbox and PC, Electronic Arts CFO Blake Jorgensen confirmed during the UBS Global Technology Conference. For now, Titanfall will be exclusive to Xbox 360, Xbox One, and PC in March 2014. 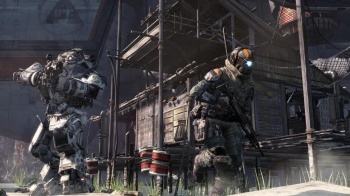 "I'm sure that there will be future Titanfalls at some point that may be on multiple product platforms," Jorgensen said. "[I] don't know, that's up to the teams that are going through that now. But at the end of the day, we're excited about this Titanfall and we think it will be a big title and it will be great for Xbox One." The news of Titanfall never coming to PS4 broke last month. Titanfall developer Respawn Entertainment of course will still make PS4 games in the future. Studio co-founder Vince Zampella responded on Twitter last month to a question about Titanfall's exclusivity, "Of course we will [makes games for the PS4], just not the first Titanfall." Zampella also tweeted then that Respawn had only found out recently about the Microsoft exclusivity. It's not a definite that future Titanfall games will be available on multiple platforms, but it's still a possibility. Titanfall is exclusive to Xbox and PC due to a business decision between EA and Microsoft. If Microsoft can make a fantastic offer to EA in the future, a Titanfall sequel may stay on Xbox and PC. If EA thinks it will make more money on a multiple platform release, you can bet they'll take that route instead.